Remember - if you saw it before and don't see it now - it sold. 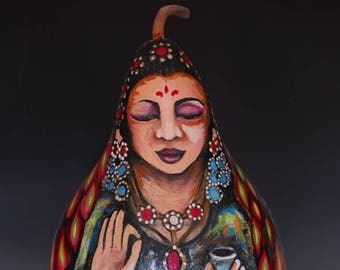 If you like something, buy it when that little voice in your head says "ooh I like that" while I offer FREE SHIPPING on all gourd art. Thank you all for your likes, your orders, and your wonderful and kind reviews. All my pieces are hand painted, sealed to last, signed, and dated by me. 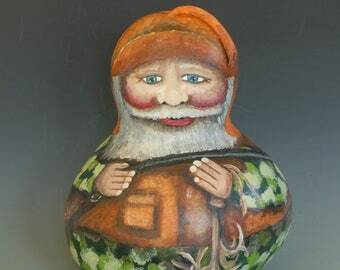 If you are not familiar with gourds, no time like the present. Dried gourds have been used for artwork, water containers, musical instruments, utensils, and more for thousands of years. A properly dried gourd will last for years. 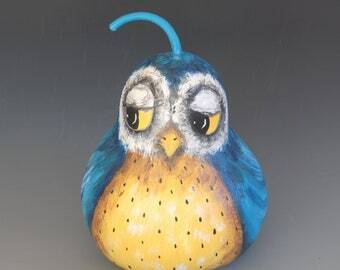 If hanging outside as a birdhouse or feeder, it is good to spray some water-based or polyurethane sealer once a year to preserve any decoration, but the gourd itself is very durable. I inspect and select every gourd I use for my artwork. 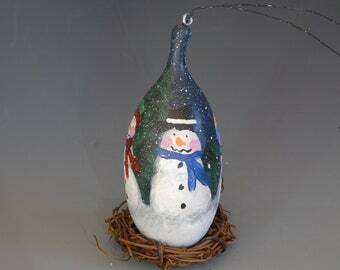 The gourd is a great canvas and lets me create traditional items like Christmas gourds as well as unusual artwork. 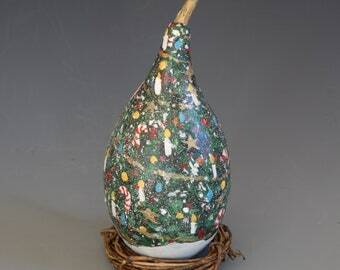 You will see some gourd sculpting, using a combination of full gourds and cut gourds. All finished pieces have a brushed on water based polycrylic sealer. 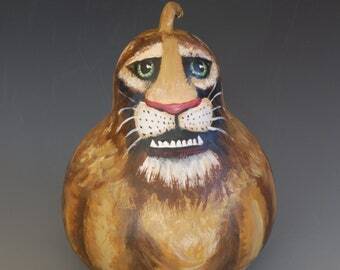 Your comments and questions about gourd art are very welcome. 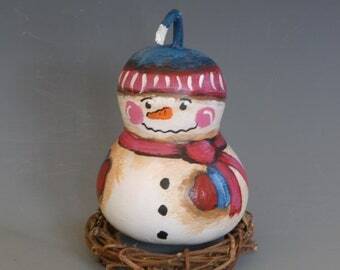 My shop has Christmas and holidays all year long, and all pieces are individually created and painted by me. 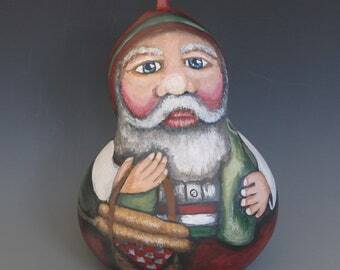 Over the years I've lost count at 4000 handpainted gourds sold, mostly at shows and festivals. But with technology came Etsy and I appreciate all my visitors, followers, and collectors. 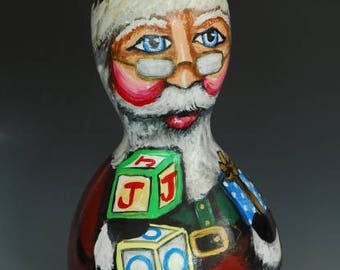 Buy something you love, even if you have to store it away for next Christmas or for a special occasion, like a birthday or "I love you friend" gift. 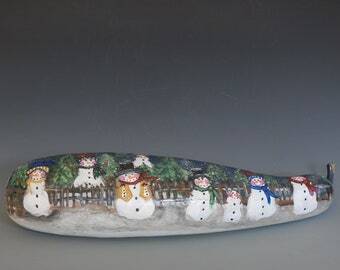 I have been making more sculpted gourd art and larger works for art shows and galleries. This includes several large dragons. I invite you to follow me on Facebook (Enchanted Gourd Art), where I have put up a series of photos showing the stages of creation on my latest dragon. I did this each day so my followers and guests could see each step. 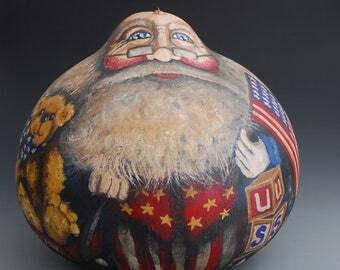 You might find this interesting, especially if you are interested in exploring gourd art yourself. Many of my sales are custom orders. I love custom orders, and it just shows how taking a look at my work can spark so many great gift ideas. Each piece is hand painted, designed, dated, signed and sealed. Thank you all for your visits, favorites, orders, and picking pieces for treasuries. Any questions? Yes, I can make that for you!! Start a conversation. 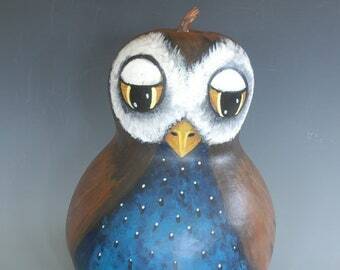 Gourd Sculpting DVD with Melynda Lotven. Start to Finish "Great American Fat Cat" with Bonus Project. Thank you so much! The figures match my set perfectly. It was great working on this custom designed piece. Everything was fast and went smoothly. It's a great addition to our collection. It's just as I expected. 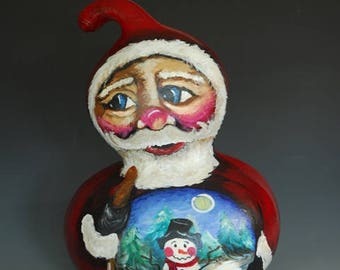 I love it for my Santa collection. I received it in perfect condition and right on time. A Good Start . . . . how it all started . . . reprinted from 1995! Moving out to the country with a pond and five acres was a life long dream of mine. Four years ago my husband and I built our home right outside of Columbia, Missouri. As a house-warming gift, four odd shaped gourds were placed on our doorstep. What was a gourd? I really had not seen or paid attention to them. I left them alone on my doorstep while moving and settling my family into our new home. They got moldy as time went on, but I was too busy to fool with them. Until one day I thought, maybe it was time to get rid of these eyesores. I picked one up and to my surprise it was hard, light and rattled. I scrubbed them up and a neighbor had told me about painting them. I was an artist selling various watercolor prints around the city and this would be a fun change. I painted them up and friends and relatives admired and wanted them. Maybe it was time to get some more of these and possibly sell them. But where do I find gourds? The second weekend of October, every year, pumpkins line the streets and yards of a little town by the river that the Katy Trail runs through called Hartsburg, Missouri. The Pumpkin Festival was where my husband had spied gourds piled around a tree in someone's yard. He came home to tell me about it and the next weekend we went to Hartsburg. What a Beautiful Sight! Hundreds and hundreds of gourds. We filled bag after bag and made wonderful friends with a farmer and his wife, Joyce and Russell Sapp. They invited me to participate in next year's pumpkin festival by selling my gourd crafts from their yard. Yes! I couldn't wait. The next year came and I did my first "Show", the 1993 Hartsburg Pumpkin Festival. What a response! People loved my gourds. They were a hit and I did quite well. 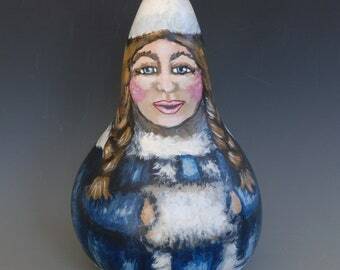 Well I now knew what I wanted to be when I grew up, besides a great mom and wife - a gourd head! UPDATE to 2013 - Hi! 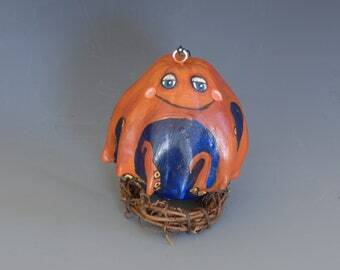 I'm Melynda Lotven and this is my Etsy Store devoted to my gourd art and all that it has inspired. 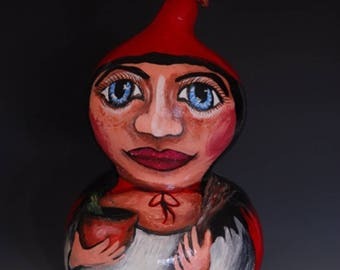 You are invited to follow my gourd adventures, purchase from my store, request custom orders, and ask many, many questions to soothe and inspire your curiosity about gourds. 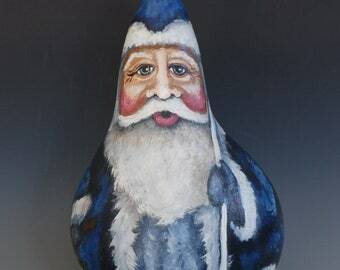 Living in the country in Columbia, Missouri is my heaven on earth, a magical place where gourds come alive and whatever can be dreamed can be created. 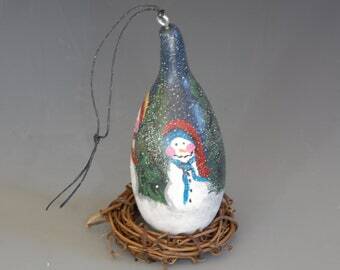 I turn moldy gourds into keepsake treasures. 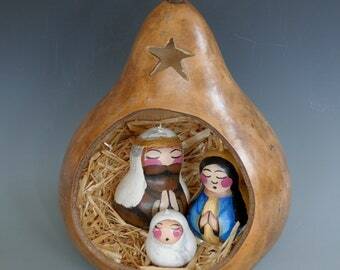 The gift of a gourd is a gift from the heart wishing all the best things in life. …thank you. 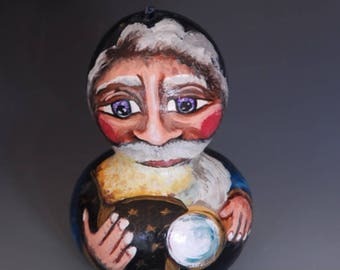 Painting gourds since 1993, Melynda has been featured in magazines, books, videos, on HGTV, on DIY Network, and is an annual visiting artist at Silver Dollar City in Branson, Missouri. 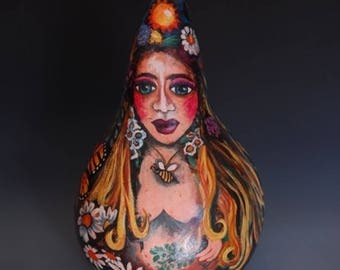 Thousands of her gourds have found homes in the US and abroad. 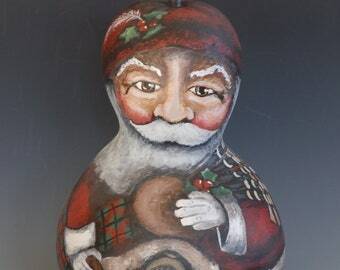 The gift of a gourd is a gift for all the best things in life! I wish for you the best, with a smile and a twinkle of magic! 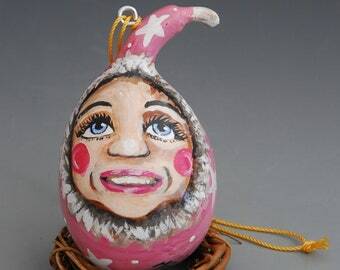 I am so glad you stopped Enchanted Gourd Art. 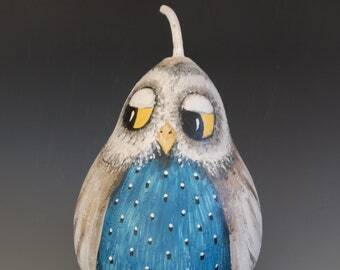 I love painting and creating with gourds, and providing projects, patterns, and how-to DVDs and books to inspire your creativity. 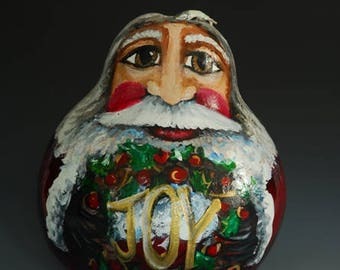 I have made thousands of gourds since I started in 1993, and am thrilled to present my work to you through Etsy. 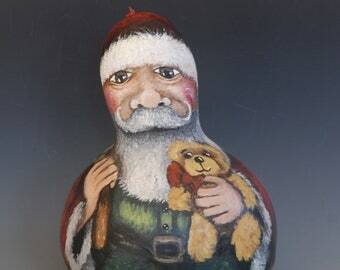 I want you to be thrilled with your gourd gift, so please contact me for any questions and special requests you have. 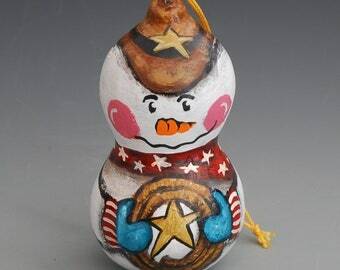 The gift of a gourd is a gift for all the best things in life! 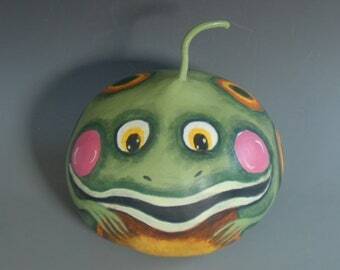 Wanna know more about gourds as a canvas and for sculpting. Read more in my shop Announcements and About posting. Everything has a 100% guarantee. If you are unhappy with your purchase, please notify my within 30 days and I will provide a refund or exchange. By the way, I have never had a request for a refund! 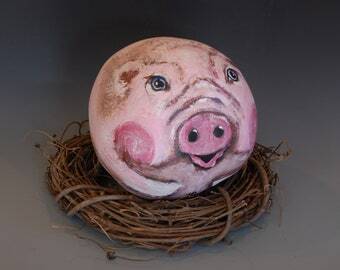 I am using the Etsy payment processing service. This will help both of us track our conversation, custom orders, and make everything work smoothly. My policy is for you to be thrilled with your purchase. All items are shipped either USPS or UPS within 1-3 days of placing your orders. Custom orders will be shipped in one to two weeks. If you need it sooner, start a conversation and I will message you to meet a gift or holiday deadline. If I am at a show or otherwise unable to ship immediately, I will contact you ASAP. Shipments include confirmation tracking and the standard insurance that comes with it. Artwork is wrapped in tissue paper, then packed securely to arrive safely. When checking out, you have some choices on delivery. There may be times when I am at a show and an item sells, and is also requested on Etsy before I get to my computer to update. If this happens, I will let you know, and I will offer to create custom order using the same design for you at the stated price. For custom orders, I will send you pictures in our conversation for approvals or choices. When done, and everything looks good, I'll create the custom order page to complete your purchase. There are some higher demand items that are made to order. 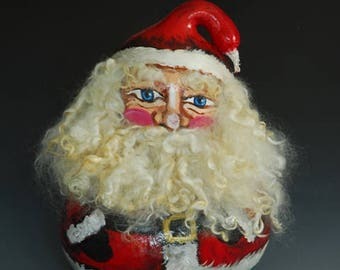 These are clearly marked in my shop, such as nativities and some ornaments.